Elementary teachers escalated their work-to-rule campaign Monday and threatened one-day strikes as Ontario Premier Kathleen Wynne urges them to accept essentially the same deals as their colleagues in high schools and the Catholic system. Elementary teachers escalated their work-to-rule campaign Monday and threatened one-day strikes as Ontario Premier Kathleen Wynne urged them to accept essentially the same deals as their colleagues in high schools and the Catholic system. "I'm not happy about the fact there's increased disruption in our public elementary schools," said Wynne. "I don't think kids should be caught in the middle." The government is offering the elementary teachers virtually the same deal that was ratified last week by the Ontario Secondary School Teachers' Federation and the Catholic Elementary Teachers Association, added Wynne. "The fact is we have been able to come to agreements with all of the other teacher groups," she said. The two other large teachers' unions voted to approve agreements that included a one per cent bonus and a 1.5 per cent pay increase, while the union representing teachers in Francophone schools also reached a tentative contract. There are special situations in elementary schools that will be addressed, but teachers must be willing to accept what their colleagues have accepted, the premier said. "Obviously, it will be a similar agreement to the other teachers because ... the parameters are set," she said. "So my hope is that we'll be able to get there quickly." The Elementary Teachers' Federation (ETFO) said its members will not take part in parent-teacher meetings or class trips and will not fill in for absent colleagues. Teachers may also wear shirts or buttons protesting the lack of a contract, and the union warned it would start one-day rotating strikes within two weeks if there's still no deal. "Despite what the government is implying, it has not offered our members the same conditions as secondary teachers," ETFO president Sam Hammond said in a release. Hammond said there is "a significant disparity" in how elementary and secondary schools are funded. "That funding gap results in larger class sizes, fewer student supports and poorer working conditions in our elementary schools," he said. "The deal the government insists ETFO accept does absolutely nothing to close that gap." 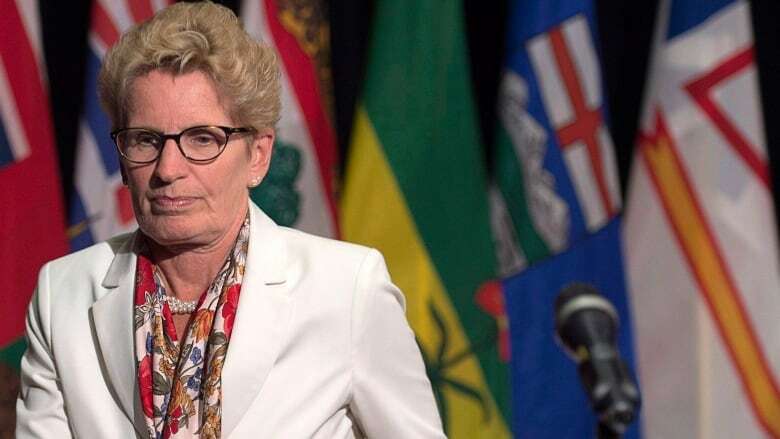 Wynne insisted she was not concerned by the union's decision to call the one-day rotating walkouts "Wynne Wednesdays," insisting it's never personal for her. "It's being personalized because that's a political tactic," she said. "It's not about my personal feelings. It's about how do we get an agreement that's in the best interests of kids in this province." Wynne said she was prepared to explain to her granddaughter why a teacher may have the premier's picture or name across the front of a T-shirt. "What I'll say to her is: 'Livvy, we're trying to get this agreement in place, to work with the teachers so that you can have the best year possible in Grade 1,"' she said. Hammond said ETFO's last contract expired in August 2014 and no new negotiations have been scheduled. "If the Liberal government had stayed at the table and not walked away, it's possible we could have reached a deal by now and the escalation of ETFO's work-to-rule could have been avoided," he said.